Be the first one to get a set of VentShades for your 2006 Hyundai Sonata. 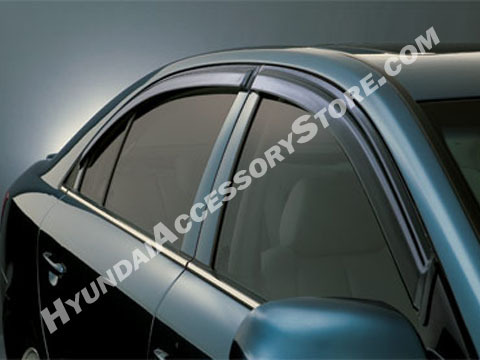 All new 2006 Hyundai Sonata Vent Visor made from durable high impact acrylic. Custom fit for your new Sonata. Made of reinforced acrylic in dark smoke grey, the Vent Visor keeps rain out and lets fresh air in. Vent Visors also reduce heat buildup in parked cars by allowing windows to be kept partially open, and install easily with 3M brand OEM-approved tape. Manufactured by Auto VentShade, a division of Lund International. Register at Hyundai Accessory Store now and recieve an additional 11% off your purchase! All Auto VentShade products come with a limited lifetime warranty* and their commitment is for your complete satisfaction. Auto VentShade products have been protecting and styling vehicles since 1935. They know how important it is to protect your valuable investment, so that's why they design products that are both functional and look cool. Made of a rugged impact-modified acrylic, they install quickly and easily with 3M Acrylic Foam Tape. Auto Ventshade is quality QS-9000/ISO 9001 certified for the design, manufacturing and distribution of Automotive Accessories. *For warranty information please see lundinternational.com Always remember to visit for latest deals available Gary Rome Hyundai , Hyundai Accessory Store and Hyundai Performance Auto Parts.